For over 40 years Raymond Hoser the snakeman has been the worlds best-known professional snake catcher, reptile handler and reptile scientist! As a matter of public record, he has scientifically named more species, genera, tribes and family of snake than any other person alive in the last 100 years! But Raymond Hoser is not just the snakeman. He has worn many hats, including as the worlds leading conservation and wildlife authority and advocate. 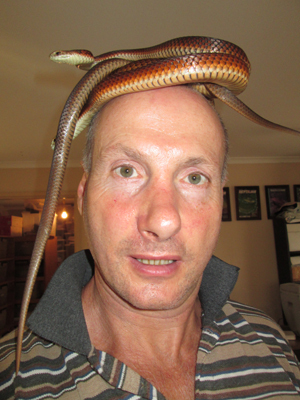 He is also the owner of Australias leading wildlife education company, Snakebusters, Australas best reptiles. Recently the trademarks office gave Ray Hoser and his company the legally enforceable right to call themselves, Australias BEST reptiles. That is because Ray Hoser and his company are of a standard way above all others. His educational outcomes are way suprerior to that of the less experienced imitators. Part of the reason for this is Hoser's unmatched expertise on reptiles. Besides having named hundreds of new species and genera, Hoser was the first to breed many rare and threatened species using methods that are now standard in herpetology worldwide. Hoser's scientific breakthroughs include devenomizing snakes surgically, artificial insemination of snakes and much more. Ray Hoser also invented the concept of kids reptile parties. It was lampooned by many when the idea was first conceived in the 1970s and still is now in the post 2000 period. But in the face of stiff opposition, now the idea has been copied worldwide with wildlife parties on offer in nearly every major city on earth, with Hoser the recognized originator of the idea. Hoser�s originality has not just been in terms of science, education and entertainment. In an action that was condemned as crazy in the beginning, Hoser was the first to publicly call for the legalisation of private ownership of reptiles and other wildlife across Australia. In a jurisdiction that banned such activity and where the government-controlled media were dead against such ideas, Hoser paid the price. He was demonized, attacked and even jailed. However after a 20-year battle, being held up for public hatred by opponents and several best-selling wildlife books, governments across Australia were eventually forced to change the law to allow private people the right to keep reptiles as pets. Unfortunately many of those in high places who fought against Hoser's push to legalise the right of people to keep reptiles as pets have borne grudges and they continue to attack Hoser at every opportunity. This has included heavily armed police raids on his home and business and even an instance where his two vulnerable young daughters were illegally arrested by heavily armed police in their own school classrooms and then a week later in their own bedrooms at home. Hoser has at times been similarly condemned in academic circles for reclassifying reptiles and at times naming new genera and species. However the science of others eventually caught up with Hosers standard and now generic and species names first used by Hoser are in general usage. Included here is the name for the worlds longest snake, Broghammerus reticulatus better known as the Reticulated Python. The name Broghammerus first being used by Hoser in 2004. It�s fitting that the snakeman Ray Hoser got naming rights on the worlds longest snake! The downside is that every time one of Hosers enemies sees a so-called Hoser name in a book, scientific paper or even online, they feel threatened and relaunch vicious campaigns aimed at trying to discredit the snakeman. In the post 2009 period a group of renegades have stepped outside the rules of the zoological code to rename more than 20 species and genera first properly scientifically named by Raymond Hoser. The snakeman and his company Snakebusters, does reptile shows across Australia, including for Melbourne parties, adult entertainment, childrens shows, kids wildlife displays, and more. Based in Victoria, the company travels everywhere although you are most likely to encounter them closest to their home base. Being the best at what they do, Snakebusters does all levels of education, ranging from nationally accredited snake handler and catcher courses, university lectures, school wildlife incursions, corporate entertainment in Melbourne, displays, venomous snake shows for events, reptile show displays for shopping malls, wildlife awareness sessions and even kinder incursions. The snakeman Raymond Hoser and his wildlife education business, is alone in Australia with a proper hands-on reptile education, that allows people to hold the animals at almost all shows. Then in his spare time the snakeman Ray Hoser is out there catching snakes, either in the bush for scientific research or rescuing snakes from conflict with people in their homes. After that he has to go back into the bush to let them go. This he usually does wherre both snakes and people are kept apart and out of conflict. Snakeman is a registered trademark owned by Raymond Hoser.